With the way the world is advancing these days, it’s no surprise that technology continues to expand its reach. 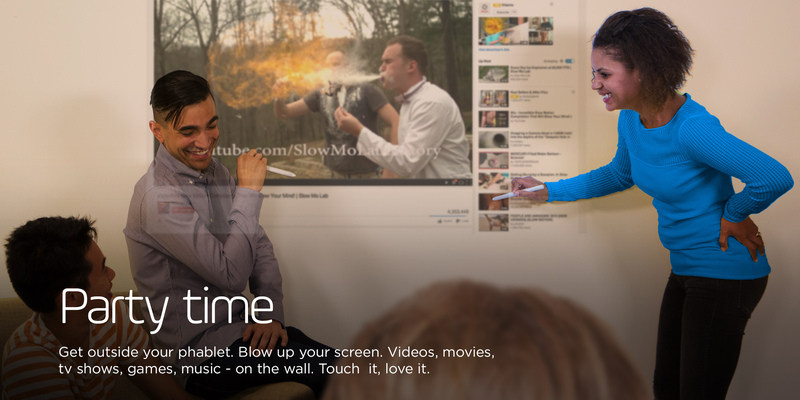 TouchJet made a huge leap in the technological realm recently, introducing their ‘Pond’ product, a portable pico projector that has the ability to turn any flat surface into an interactive Android touchscreen. This can have huge implications for business professionals and families alike, as it eliminates the need to invest in large projector screens or interactive whiteboards, which usually cost around the 3k mark. The TouchJet Pond is set to cost roughly $760. TouchJet has raised nearly $900,000 in pre-sales through the crowd-funding site IndieGoGo in 2014. So, what makes the TouchJet Pond unique? For starters, it has an inbuilt system running Android 4.4, making the interface very familiar for Android users. More importantly, TouchJet aims to remove the need for an HDMI adapter, as they utilize a microUSB port for ease of connection with any Android smartphone. It comes packed with a WVGA resolution (854×480), measuring at 3 x 11 x 10cm, and weighing just 300g. It comes complete with two styluses, components that make possible a virtual touch screen. Upon projecting the desired content, pressing the stylus onto the projection surface activates the IR transmitter, which then gets decoded and turns the signal into a touch input. Calibrating the receiver using a pre-installed app makes the taps on the projection feel very responsive. Additionally, using other apps that rely on touches (i.e. 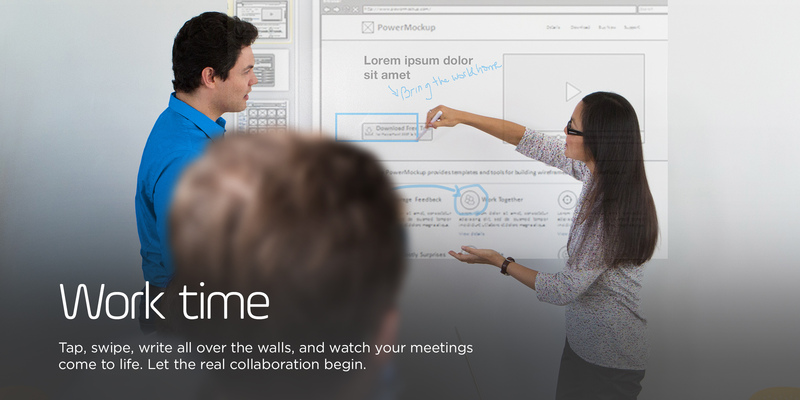 whiteboard or drawing software) gives users the feel of actually writing. Now, it’s important to mention how the interactive features actually operates. The IR receiver relies on line of sight, so users must be cautious to not stand directly in front of the projection source when writing/drawing on the surface. Unfortunately, this means users must stand off to the side, which might create an uncomfortably awkward situation. This can be a slight setback, but another feature overshadows this aspect. If the projection surface is a textured wall, users can still utilize the interactive feature without having contorted lines by pressing a button on the stylus. Users will then be able to hover right above the projection surface without touching it. The Pond features an 80 Lumen LCD lamp, which is not really the most impressive feature. However, TouchJet claims to have placed the product at varying distances from different surfaces and were able to nail down adequate image qualities. They do recommend, however, that users choose a flat, white surface to optimize image quality. It boasts a 20,000 hour lamp life, about four times that of many traditional lamp projectors. There is an economy mode that makes it capable to run for up to two hours. It’s important to note that the brightness level goes down to about 50 Lumens in this setting. A Bluetooth remote controls the onscreen cursor, while the IR remote emulates keystrokes. Users can also control the Pond using their own Bluetooth keyboard and mouse. You will also have the option to connect a regular USB keyboard or mouse into the microUSB port through an included microUSB to female USB adapter. Additional features are built-in WiFi, Bluetooth connectivity, a microUSB port, miniHDMI, and a 3.5mm audio jack. The internal speakers are not very powerful, so users are advised to acquire a separate Bluetooth speaker. 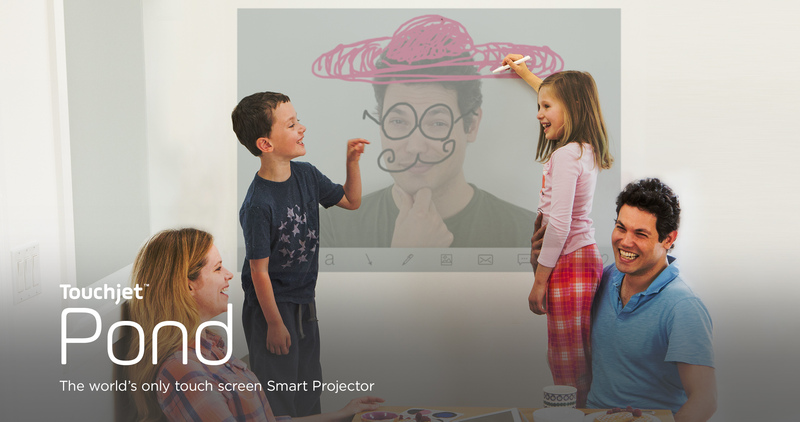 All in all, the TouchJet Pond is a great alternative to traditional interactive whiteboard systems. However, its limitations come in the form of the lack of brightness, fair resolution, and the limitations of its IR system. However, it is a perfect portable tool for business professionals and families seeking a great interactive multimedia experience. Although it is a revolutionary product that is taking steps in the right direction, it remains to be seen whether or not other electronics powerhouses will follow in their footsteps.